Can't wait!!! This show has been on my must-see list pretty much since it opened nearly 10 years ago. So yeah, it's been a long time coming. The hub got us tickets for my birthday - a BIG splurge for us. But seeing as this is my last birthday before Sam gets here, we figured we better live it up! I think we're gonna hit Baraonda before the show for some pizza... mmm... one of my faves! So fun! Don't you just love birthdays? I think 34 is going to be pretty darn awesome. Happy Birthday! I've always wanted to see Wicked too. Happy birthday! I think this will be your best bday ever! Happy Birthday! You will LOVE LOVE LOVE the show (I've seen it 5 times). Have a wonderful time tonight - you deserve it! Happy Birthday!!! 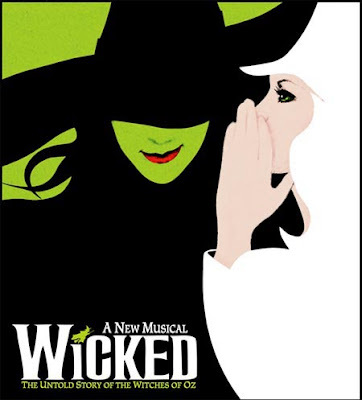 Wicked is my most favorite show ever! Enjoy your fabulous night out! Happy birthday and enjoy the show. We went a couple of weekends ago and actually asked each other if there was a way we could swing going again before it left town. Ha! Have a great day! Happy Birthday! Enjoy the show. I'm going to see Wicked on Tuesday!! It's our anniversary and I'm psyched to go and see it! Happy birthday, Bestie! Have so much fun at the Emerald City tonight. Happy birthday! Hope you have a fabulous time at Wicked!